The "World Furniture Outlook Seminar" is a unique occasion to gather comments on the key facts regarding production, consumption and trade of the major industrial economies worldwide and to present CSIL forecasts. CSIL experts will introduce their forecasts concerning the furniture sector worldwide and commented on the main factors affecting production, consumption and trade of furniture on a global scale. 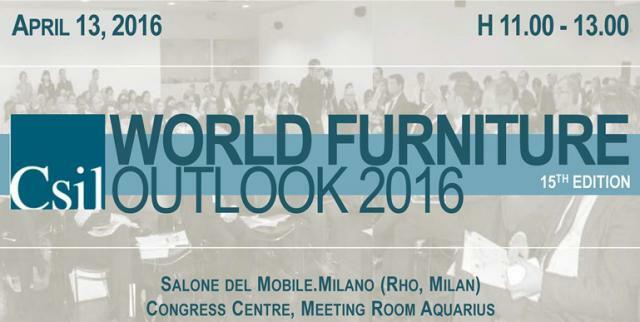 World Furniture Outlook 2016 providing an overview of the world furniture market with historical statistical data and furniture markets forecasts for 70 countries. The report will attain its XVII edition in 2016. Upholstered furniture: world market outlook CSIL overview of the world upholstered furniture market. In 2016 this report will attain its XIV edition. To attend the event please send an email to seminar@csilmilano.com indicating your contact details (Name, Surname and Company name). 15th edition of CSIL Seminar "World Furniture Outlook"